I'm trying to be better about eating naturally, so diet soda was something I wanted to give up. This wasn't too hard for me since I usually only have soda as a treat, however, since I still enjoy fizziness I turned to Izze. I first tried the juice at Chipotle but now I buy them by the pack at Wegman's. 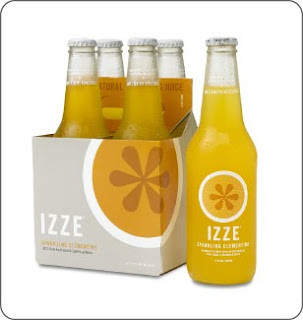 What I love about Izze is that they aren't full of gross chemicals, and yet still delicious! As it says on the bottle, it's "All natural. No refined sugars. No caffeine. No preservatives. It's 70% pure fruit juice with a splash of sparking water." I love this stuff! My favorite flavor is the refreshing Sparkling Clementine, which tastes just like orange soda (YUM). I also really like the Sparkling Pomegranate and Sparkling Grapefruit. To all my natural food friends - any other yummy natural sodas? I've never tried Jones Sodas, are they any good? if you HAVEN'T tried Jones, go for it. they make tasty stuff. I like izze's best, yes indeed. Mash sodas are trying to do something similar. not as good, but a not-bad substitute. What flavor of Jones should I try first? Starla - is Mash the kind at Cafe 100?